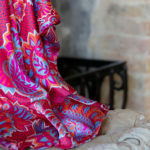 You are here: Home / Blog posts / Celebrity Style – see how they work a print! Celebrity Style – see how they work a print! It’s finally spring; time to put away your winter wardrobe and opt for a lighter, transitional style and bolder palette. This month, we’ve been looking at Holly Willoughby and Jennifer Lopez to show you how some of their best looks can be incorporated into your own wardrobe. One of our most popular products, the D’Arblay Shirt in the Tattoo print, comes in a variety of bold and statement colours – to make you stand out from the crowd, no matter what the occasion. 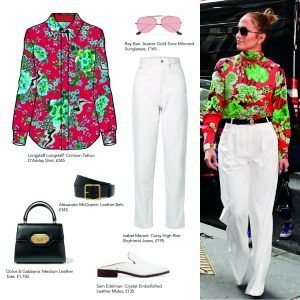 Jennifer Lopez presents a laid-back and punchy look that can be worn during both spring and summer, especially if you are travelling in the next few months. This outfit focuses on the contrast of colour and shape as she pairs a fitted, bright red shirt with a pair of white, high-rise pleat fronted trousers. This combination really allows the print to pop as the black belt breaks up the contrast of print and white. Opt high-rise boyfriend jeans and black accessories with our Crimson Tattoo print shirt. A classic pair of white mules will emphasise a look that is sophisticated and perfect for the season. Holly Willoughby loves showing off her floral prints and she looks amazing in them. Whether going for a light or darker print, similar contrasting layers can highlight each design. Give your feminine style an edge this Spring by pairing one of our silk shirts with leather pieces and accessories. A mixed denim and leather skirt will give structure to your look but remain flattering to every body shape. Black combat boots provide the perfect transition from the colder months. These will see you through until Summer with shearling details and a slouchy, unstructured hobo bag that softens the entire look. A darker, toned-down palette is ideal for a date night or colder evenings out and about. Alternatively, the Moss Tattoo print is a light shade of khaki, which will be your new daytime favourite. Pair it will your favourite pair of skinnies for a relaxed look and either some ballet pumps or mid-heel court shoes and you’ll be the envy of Instagram before lunch time! A small bag will allow you to carry your daily essentials and add a little structure to your outfit without drawing attention away from the bold, printed shirt. For this combination, we’ve selected a beautiful cross-body with a crocodile effect that will give an extra bit of pizzazz to your style. Neutral accessories are key across all three designs. Which print is your favourite? The D’Arblay shirt from our Tattoo collection is available now on our website. If you don’t see the variation you were after, email us for custom orders and we’ll create the perfect shirt for you this season. … indulge your inner Hollywoodscreen siren an slip into something more comfortable- like the totally glamorous and utterly decadent silk loungewear from Longstaff Longstaff..
Longstaff Longstaff’s Buttercup kimono - sassy as hell!